A Solderless Breadboard is used to help design new electronic prototypes. Since it is designed with the idea of reusability, it is an effective replacement for protoboards and jumpers or wirewrap panels before commitment to etched circuit boards. With the advent of the Solderless Breadboard, it became much easier to experiment with different electronic designs. It allowed the beginner, as well as the engineer, an easy way to turn a concept into a working circuit. Solderless Breadboards come in many different flavors. There are simple unpowered Breadboards all the way up to units with multiple power supplies attached to it. But the basic design of the Solderless Breadboard has not changed since it was created. So how does it work? 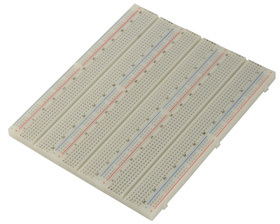 A Breadboard is created with strips of metal below a plastic surface with holes in it. There are row after row of these clips. The spacing of these holes is based on a measurement of 0.1” which corresponds with the spacing of the original basic integrated circuit device (IC). Generally, there are both horizontal strips and vertical busses. As it was originally designed for the .3in. width IC, the Breadboard is divided in half with gap in between. Each half corresponds to the row of pins on each side of the ICs. As the IC is plugged into the board, each pin makes contact with one spring contact in a row of 5 reaching out from the IC, pin for pin. This will allow you to make plug in connections at these points, allowing you to “build” your circuit, pin for pin, one component at a time. If you need more contacts to make connection to multiple items, simply pick a row that is not used, jumper to it and all items plugged into that row on the Solderless Breadboard will be connected. The holes accommodate things like, IC’s, resistors, capacitors, small coils, transistors, and about anything with leads around .025in. Almost everything you can solder into a copper circuit. This is what makes the Solderless Breadboard such a valuable tool. Most Solderless Breadboards also have multiple BUSS connections along the edges, parallel with the IC. These are generally used to supply your source voltages and other common signals such as power and ground at any point you will need along the circuit you are experimenting with. Most have a row of two on each side. There are several configuration of this, but it is very obvious as to the layout of the holes based on over printing on the surface of the Solderless Breadboard. As we mentioned above, the Busses are used for power, we will now introduce POWERED breadboards. 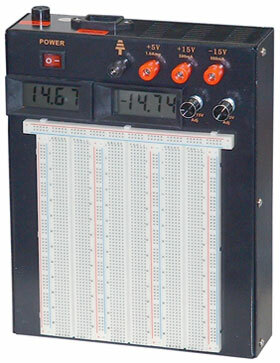 Some test benches might not have a Variable Benchtop Power Supply available and this is where you would use a Solderless Breadboard with built-in Power Supplies. The power supplies are located beneath the breadboard. This approach lets you make the prototype circuit portable, with only the need for a simple 115VAC outlet to power your project. Some Powered Breadboards like the MPJA 17710-TE have multiple voltages available. This Solderless Breadboard as 3 separate voltage outputs with a digital readouts for precise settings. By using multiple snap together Solderless Breadboard BUSSes and sections you can create as large an array as needed to design & debug your circuit.